The SpaceX Dragon commercial cargo craft makes its relative approach to the International Space Station prior to grapple by the station's Canadarm2 robotic arm, controlled by Expedition 33 crew members. This image was taken Oct. 10, 2012. A privately built spacecraft will carry some extra creepy cargo back to Earth from the International Space Station Sunday (Oct. 28): astronaut blood and urine. 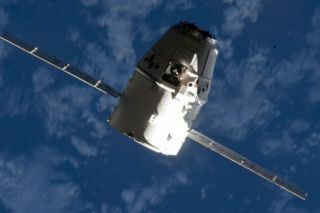 Hundreds of blood and urine samples, some in bags and others in syringes, are returning to Earth aboard an unmanned Dragon space capsule that is wrapping up the first commercial cargo flight to the station by the private spaceflight company SpaceX. The Dragon capsule is due to leave the station just after 9 a.m. EDT (1300 GMT). "Bio samples, experiments, and hardware loaded into #Dragon; hatch is now closed. Next stop, Earth!" SpaceX officials wrote via Twitter Saturday. You can watch the Dragon capsule undocking live today here on NASA TV. The webcast will begin at 7 a.m. ET (1100 GMT), with the spacecraft splashing down at about 3:20 p.m. EDT (1920 GMT). There are 384 syringes of urine and 112 tubes of blood packed aboard Dragon, some of which have been waiting for delivery to scientists on the ground for more than a year. The samples were taken by space station astronauts as part of two ongoing experiments studying the nutrition of astronauts and how their diet can help protect against the negative health effects of long-term space travel, such as bone loss. "While it may seem very strange to some folks, my typical line is that, 'It may be urine to you, but it's gold for us,'" NASA nutritionist Scott Smith of the Johnson Space Center said before the Dragon mission. "There's a lot of science that comes out of this." Smith said his team has not returned any astronaut blood and urine samples from the space station since July 2011, the month of NASA's final space shuttle mission before the fleet was retired. Since then, the samples were stored in freezers awaiting the Dragon spacecraft. American astronauts, meanwhile, traveled to and from the station on Russian Soyuz capsules. "The novelty at this point with SpaceX is that this is the first real return vehicle for these types of samples," Smith said. "We can get the crew home onboard the Soyuz, but the cargo capacity on Soyuz is quite limited." Unmanned resupply spacecraft built by Russia, Japan and Europe are all designed for one-way trips. After making their deliveries, the spacecraft are intentionally burned up in Earth's atmosphere for disposal. SpaceX is one of two private companies with NASA contracts to supply unmanned cargo deliveries. The other company is Orbital Sciences Corp. of Virginia, which has a $1.9 billion for at least eight resupply flights using its new Antares rocket and Cygnus spacecraft, which are also designed to be disposable. The first test of an Antares rocket is set for later this year. SpaceX, short for Space Exploration Technologies, launched the current Dragon space mission on Oct. 7 from Cape Canaveral Air Force Station in Florida. The robotic spacecraft arrived at the International Space Station on Oct. 10 to deliver nearly 1,000 pounds (453 kilograms) of supplies to the orbiting lab's Expedition 33 crew. Today, the station's six-person crew will use a robotic arm to pluck the Dragon capsule free of its docking port on the bottom of the orbiting lab, and then set it free so it can re-enter Earth's atmosphere. The capsule is expected to splash down in the Pacific Ocean off the coast of Southern California. A SpaceX recovery team will retrieve the capsule and transport it to a facility in McGregor, Texas, so it can be unpacked. The blood and urine samples and the rest of the cargo will then be delivered to NASA's Johnson Space Center in Houston. "This flight is really all-out, maxed out, fulfilling our research needs," NASA's space station program scientist Julie Robinson said.